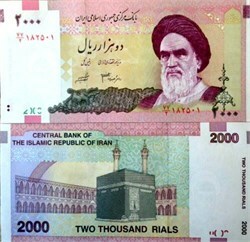 Iran Paper Money - 2000 RIALS - Images of Khomeini and Mecca. Watermark: Khomeini. Home > Paper Money, Checks, Annual Reports, Postcards, Lobby Cards > Checks, Paper Money, Billheads, Letterheads > Old Paper Money / Obsolete Currency / Scrip > Iran Paper Money - 2000 RIALS - Images of Khomeini and Mecca. Watermark: Khomeini. Home > Rare and Unique, Specimens > Old Paper Money / Obsolete Currency / Scrip > Iran Paper Money - 2000 RIALS - Images of Khomeini and Mecca. Watermark: Khomeini. Lilac and green on multicolored underprint. Khomeini at right. Back: mosque interior in Mecca. Watermark: Khomeini.